When I was thinking about starting a career in PR, I searched high and low for peoples’ genuine experiences of the industry and exactly what an average working day would involve. I actually found it near enough impossible to find this, so I thought I would share what my day involves for others looking to step on to the PR ladder or perhaps even looking to apply for a role at Eskenzi. 9am – Monday morning and it is my week to do the daily newsletter which we send out to clients, so I come in a little earlier than the usual 9.30am start (which I feel is a real luxury). I look through all the technology news websites for any cyber attacks or relevant stories and compile a newsletter to send to our clients. Next, I look through the 60 or so emails I received since I left the office on Friday and deal with anything urgent first. Then I make myself a well deserved coffee and croissant to start off the day. 10am – Throughout the day it is my job to monitor the news and if keep an eye out for any stories relating to what our clients do. If a relevant story breaks in the news, I send a rapid response opportunity to the client asking them to comment quickly – this is so that we can send the comment out to journalists who may be writing up a story on the topic and hopefully secure coverage for our clients. If there is a big breach such as Talk Talk, we would send the story to all of our clients immediately. Working for such a specialised agency with a good reputation means we also receive many comment requests directly from journalists. 11am – My account manager and I jump on a call with the French and German teams to discuss internal activity on a client. Then I prepare the weekly report which captures all our activity for the past week as well as all the coverage we have achieved for the client, which we then share with the client in the afternoon. 12pm – A large part of my role requires me to produce written content on behalf of our clients; this can vary from writing a press release or article pitch to reworking an article to make it exclusive for a publication. So if you are considering a career in PR you must enjoy writing – but remember this is mixed in with many other activities, unlike journalism where you would be writing all day long. 2pm – I come back from lunch and jump on a conference call with a journalist and a client which I organised last week. The journalist is interviewing the client and it is my job to make sure both are comfortable and have all the information they need. 3pm – There are constantly little odd jobs popping up, from editing images on Photoshop or managing a Twitter account to organising events and parties. We distribute these odd jobs between ourselves based on our individual abilities and interests and juggle them with our responsibilities to monitor news and produce content throughout the afternoon. 4pm – The client calls start. As most of our clients are based in the US, we only have a few working hours a day which overlap with theirs, so most of our client catch up calls are in the afternoon, which is often a nice relaxing way to end the day. 5pm – I finish off any admin such as updating the website or compiling all client comments into a comment bank. So these are my main responsibilities as a PR account exec at Eskenzi, however my day is never really quite as structured as this as no one day is ever the same when you work in PR! Journalists call, clients decide to suddenly break a big story or a huge data breach happens and you have to drop everything to deal with it. Being organised and able to multi-task is essential. On top of that we also have events such as Security Serious Week and InfoSec to prepare for and although this can be stressful at times, it is nice to get out of the office and try new things within your role. In terms of the general working environment, the Eskenzi office has a very relaxed atmosphere with no dress code and usually music playing in the background and we are given plenty of flexibility such as working from home, should we need to. There are eleven of us working here so there is a real family feel in the office; for example, we are taken out for lovely lunches to celebrate each one of our birthdays. 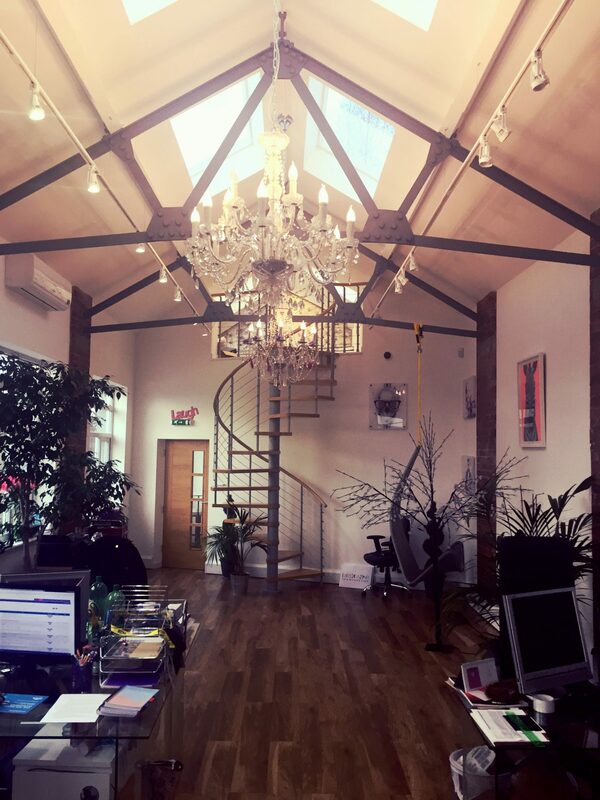 Additionally, as you can see in the picture below, our gorgeous office certainly makes going to work more enjoyable.